What is the Wacom MobileStudio Pro? 2016 has been a creative professional’s dream. First we had Microsoft’s attempt to wow artists with its i7-powered Surface Book and glitzy Surface Studio. Then, mere weeks later, Apple unveiled its new MacBook Pro with Touch Bar, a product tailor-made for videographers. For me, though, 2016’s holy grail of doodling tech comes from Wacom. Its latest iteration of the MobileStudio Pro has been designed from the ground up with creatives in mind, and other than a few niggling issues, it’s the ideal choice for designers, artists and photographers alike. However, with prices starting at a hefty $1,999.95 for the most basic 13-inch model and $2,499.95 for the 16-incher, the MobileStudio Pro will be complete overkill for anyone else. Wacom hasn’t stated its UK price yet. The MobileStudio Pro isn’t for general consumers; it’s for creative professionals and “prosumers” who take their hobbies very, very seriously. This fact is reflected in its design, which places functionality firmly ahead of aesthetics. 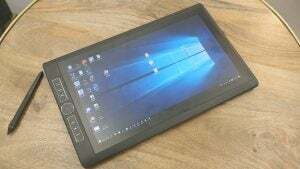 The tablet PC comes in 13-inch and 16-inch options. I had a brief hands-on time with the 13-inch model but my week of in-depth testing was spent with the 16-inch model. Both models are a design revelation compared to Wacom’s Cintiq range of tablet PCs: thinner, sleeker-looking and generally less boxy. Neither model has the design chic of the more consumer-friendly Surface Book and MacBook devices, though. Wacom is marketing both as mobile workstations for creative professionals and enthusiasts. The 13-inch model that I had the opportunity to have a brief play with is reasonably portable. Despite being slightly chunky, it’s suitably satchel- and travel-friendly, and its 1.42kg weight is roughly on a par with most 13-inch laptops – such as the MacBook Pro, which weighs 1.37kg. I’m also pleased that the tablet comes with an attachable physical dock for the MobileStudio Pro’s Wacom Pro Pen 2 stylus. Too many tablets I test use a magnetic mechanism to dock the stylus, which inevitably leads to numerous games of “where’s the damned pen”. The 16-inch model on review here is a particularly cumbersome beast, which won’t fit into regularly sized satchels and backpacks. At a hefty 2.2kg, it’s also a little on the weighty side to lug around 24/7. It’s not designed for that and you shouldn’t treat it like a go-everywhere laptop. Build quality is excellent. The device may be hefty, but its plastic chassis feels solid; it survived the rigors of my commute without coming to any harm. I’m also super impressed with the Express Key system that Wacom has created, which makes it easy to use professional graphics and editing software packages, despite the lack of an attached keyboard. If you want one, a wireless keyboard is available as an optional extra via Wacom. The 13-inch model comes with six Express Keys on its left, while the larger 16-inch version has eight. The keys flank the left side of the tablet’s front face and are split into groups of three or four via a useful touch wheel and central control button. Express Keys are fully customisable, and can be set to application-specific configurations. This means you can set them to switch to your preferred keyboard shortcut setup for software such as Photoshop, Adobe Premier, 3D Studio Max, Blender, Krita and ZBrush. The control wheel acts a second input that lets you switch between menus, or adjust settings on the fly. Out of the box, the bar brings up options basic for scrolling between layers, brush sizes and colour hues and zooming in and out. The system is great for digital painters, photographers using the tablet for touch-up work, and videographers working on edits. Those who wish to can adjust the dial’s settings to make it open more specific menus, or to take different actions for tasks such as 3D modelling or CAD design work. Having used the tablet to ink and colour a couple of comic pages, I can confirm that the system works a treat. After a few minutes tinkering with the shortcut key settings, I was able to doodle away distraction-free, using the Express Keys and Wacom Pro Pen 2 stylus in a variety of different software packages, without yearning for a keyboard. The Wacom Pro 2 Pen stylus is one of the best I’ve used and makes competing hardware, such as the Surface Pen – which is powered by N-trig tech – appear slightly clunky. Wacom claims the new Pro Pen 2 is four times more accurate than its predecessor. On paper, this gives the stylus a staggering 8,192 pressure sensitivity levels. The Surface Book’s Surface Pen has a meagre 1,024 by comparison. Initially, I thought the figure was simply showing off – and I’m still not entirely convinced that people coming from Wacom’s older Pro Pen will notice the difference in pressure sensitivity. However, there’s no denying the Pro Pen is still the king of digital styluses. It’s super accurate and when used with compatible software packages – such as Photoshop, Illustrator and InDesign – it was wonderfully reactive to changes in pressure and angle. Put simply, this is the only stylus I’ve used that actually replicates the nuances of drawing with a pencil, pen or brush. The only time I ran into any problems was when I tried using the pen with freeware. Krita works fine, but freeware GIMP was more of a mixed bag and I never got it working in a satisfactory manner. It’s worth checking compatibility with your creative suite of choice before buying. I’d also have liked Wacom to build a stand onto the MobileStudio Pro, instead of selling one as an optional extra. Cheaper tablets such as the Surface Pro 4 have innovative kickstand solutions that make it easy to adjust the screen to a comfortable angle, so you don’t have to sprain your wrist or awkwardly lean over the device when drawing. This is a professional device, and perhaps some buyers will have their own drawing board setup and don’t need a stand, but it still seems very tight-fisted to not ship with a stand. The one you can buy can be attached using screws, but I wasn’t supplied with one so can’t comment on its usability. I’m also not entirely happy about Wacom’s decision to include only USB Type-C ports with the MobileStudio Pro. The 16-inch comes with four USB Type-C ports, which lie across its right side. During the London launch of the product, a Wacom rep said that, “since Apple went that way with it’s new MacBook, we know that’s the direction the industry is going”. To an extent, I understand the argument: time and again we’ve seen the creative industry follow Apple’s lead, and it’s inevitable that more devices and peripherals will rapidly appear using the standard. But we’re not at that point right now. Today, USB Type-C is still relatively new and most people’s scanners, memory sticks and monitors won’t have the correct cable connectivity to work with the port. As a result, those who want to connect the MobileStudio Pro will have to shell out for new cables and adapters. Given the device’s generous proportions, I can’t help but think that Wacom could have squeezed in at least one USB 3.0 and a mini-DisplayPort. The addition of an optional RealSense camera is another interesting feature that I can see being a huge selling point for some, but completely pointless for others. The RealSense R200 3D-scanning camera is an optional extra on the more expensive configurations of the MobileStudio Pro, and it replaces the tablet’s basic 8-megapixel rear camera. It won’t be of much use to people who work in 2D, but I can definitely see the appeal for CAD designers and 3D modellers – even though the tech is still very much in its infancy. RealSense is a specialist camera and sensor that can detect and record spatial information, such as depth. The latest version used on the MobileStudio Pro does this by shooting out a dot pattern that isn’t visible to the human eye using a custom IR camera. Paired with the specialist Artec scanning software that comes bundled with the MobileStudio Pro, the tablet studies how clustered or spread out the dot pattern is at various points, and cross-references it with the main underlying image being captured by the camera. From there it can detect depth and create a basic, low-polygon 3D model. Testing the software I had mixed results for a variety of reasons. For starters, the software has very clearly been designed with engineers in mind. As a result, the Artec scanner UI has more boxes, sliders and glitzy dials than a steampunk mech and will be fairly difficult for regular artists to navigate. My early scan attempts generally resulted in a wire-frame model that resembled a Lovecraftian monster, not my intended subject matter. After a few attempts I did partially get the hang of it, managing to get some decent basic wire-frame models that were good enough for me to work into Blender. I still haven’t managed to get the textures up to scratch for UV mapping, but I’m guessing that’s more due to my ineptitude than the tech itself. There are also some technical issues around RealSense as a product, however, which can’t be so easily fixed. For starters, the system doesn’t work with black or shiny objects very well at all. If you try to scan objects with either of these finishes you’ll end up with a messy, noisy, chaotic model. The scanning process also requires a lot of space. The Artec software offers a variety of capture angles and distances, but I found the that the camera’s range only really works when you’re scanning from between 0.5 to 4 meters. Outside of these ranges, models have a lot of holes and there’s noise in the depth streams, even if you tick all the auto-fill boxes. The fact that you have to walk around the subject to get a reliable model also means you require a lot of space, which will be an issue for startup studios and amateurs working from home. The post Wacom MobileStudio Pro appeared first on Trusted Reviews.